President David Granger speaking with the media. 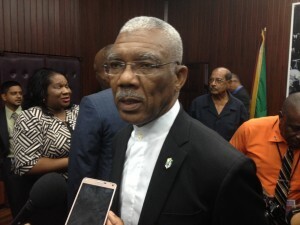 President David Granger says that the final report from the Commissioners of the Walter Rodney Commission of Inquiry (CoI) will be released soon, affirming that he is not afraid of the contents of the report. Granger made the statement in the face of continued criticism and calls for the APNU+AFC administration to release the report on the death of the historian and political activist to the public. On Wednesday, the President stated that the report will be laid in the National Assembly and copies will be sent to the family of the political activist. “Cabinet has not made any decision and in due course we will and I intend to release it, I am not afraid of releasing it and let the public judge for itself,” said President Granger. He said that all that is remaining is for the Cabinet and the six Parties that form the coalition government to formulate an opinion on the document. The reports blames the Forbes Burnham led PNC Government of 1980 for the death of Rodney.